hand and then filled in all the colors. I wanted to make something different this year for a Thanksgiving cake so I came up with this idea. I used a dome pan and make two jumbo cupcakes for the turkey’s thighs. I made two indentations on each to put the cupcakes in and tooth picks to secure them. Rolled up brown construction paper was used for the legs and slid over wooden skewer. I stuck them into the thighs. I make those little "paper frills" and stuck them on the end. The icing is coconut pecan. 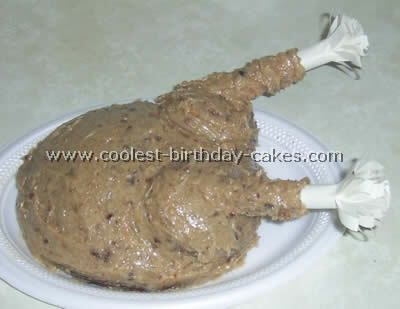 I thought it looked the best for a cooked turkey. It was a big hit and very easy to make. 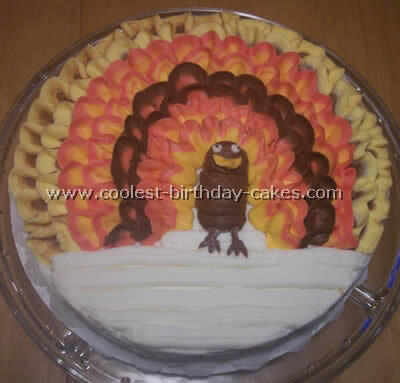 It was so much fun to decorate this Thanksgiving cake! First I made a two layer carrot cake and two batches of cream cheese frosting and one batch of chocolate icing. I frosted the whole cake in the white. I then filled a pastry bag with 1/2 Chocolate and 1/2 yellow frosting (if you’re looking straight down into the open end of the pastry bag fill the left side of the bag with chocolate and the right side with yellow) and use a #125 tip (large petal tip).Now using a waving motion make a ruffle from 8:00 to 4:00. 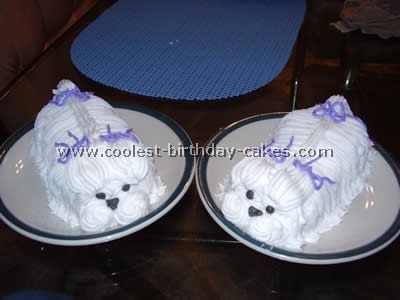 Make sure to arch your wrist with the cake so the ruffles are consistent. Next using the same tip fill a pastry bag with 1/2 red, 1/2 orange, with red against the small end of the tip and orange against the wide end. Make two ruffles following the same curve overlapping slightly. Next use a bag with brown at the small end of the tip and red at the wide end and do two rows. Use the red and orange again and make the last two ruffles. I used a large round tip with chocolate frosting, built up a neck and head for the turkey. Use a leaf tip in orange and pull out a beak. Pipe tip two eyes using a tooth pick dipped in black food coloring to make the pupil. Make a pastry bag and cut off about one and a half inches and fill it with white. Pipe the horizontal lines below the turkey’s body. Now pipe tip the legs and feet in chocolate or orange. I piped a shell bottom border and used a texture scraper on the sides of the cake. This Thanksgiving cake was a huge hit at our family’s Thanksgiving Dinner! 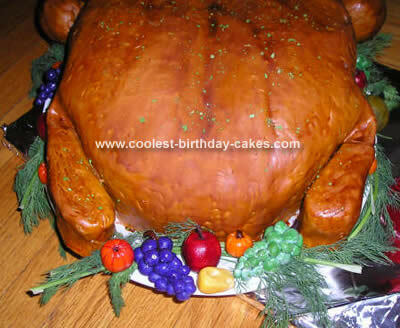 I made this turkey into a Thanksgiving cake. Many people thought this was a real turkey, which was a huge compliment. I used 10 cakes to get the size I needed. I carved, shaped and butter creamed. I then dyed fondant a yellowish color. I laid fondant and hand painted the rest to get color I needed. I had to make the drums out of Rice Krispies and covered them in fondant as well. The fruit is made out of marzipan. For the stuffing I baked pound cake which I dyed some of it brown. I cut it in squares to mimic stuffing. I painted a thin layer of royal icing on a silicone mat, let it dry and crumbled it to look like parsley. 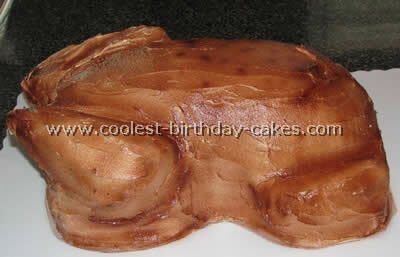 I wanted to make turkey frills out of gum paste but ran out of time and made them out of parchment paper. It would have been cool if entire cake was edible. I must say this was a work of art and still do not know how I ever did it. 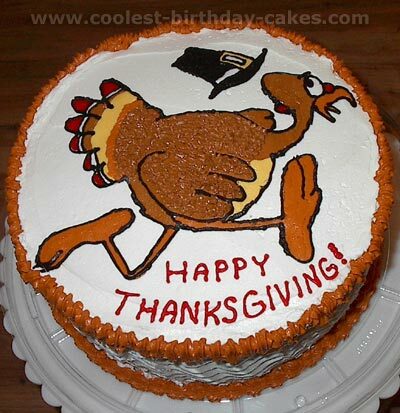 I hope you enjoy and can create a Thanksgiving cake as well. The turkey thanksgiving cake was the 5th cake I had ever made. It is a white chocolate cake with white chocolate cream cheese frosting. 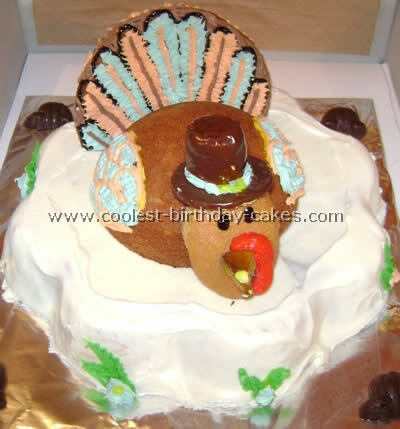 It was covered in marshmallow fondant and decorated to look like a turkey using gum paste feathers, neck, head, and top hat. 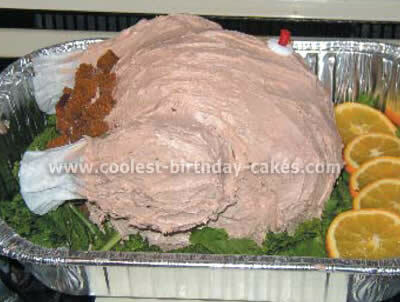 The turkey shape was created by layering two 12-inch cakes with a 10-inch cake on top. Frosting was put between the layers and the thanksgiving cake was put in the freezer (covered with plastic wrap) to harden up so carving the shape would be easier. The shape was carved by hand using a serrated knife. 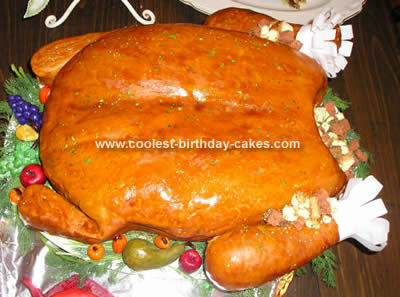 Afterwards, a crumb coat was applied to the outside and the fondant was placed over the top and smoothed to finalize the shape of the turkey’s body. The feathers, neck, head, and hat were painted using diluted paste cake coloring. 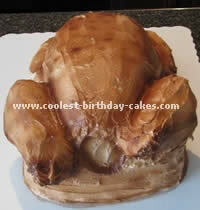 The feathers were stuck into the back of the turkey and the neck/head was attached to the cake using toothpicks. 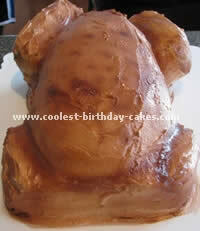 The hat was glued on top of the head using a small amount of the frosting. Lastly, the body was brush painted to create a "feathered" brown body. The ends of the feathers in the cake began to dissolve from the moisture in the cake, causing them to fall off or bend. This could be avoided by covering the ends of the feathers in plastic wrap or a similar material. The neck/head piece needs to dry for at least 4 days, as it is very thick. This thanksgiving cake was just for fun on Thanksgiving. 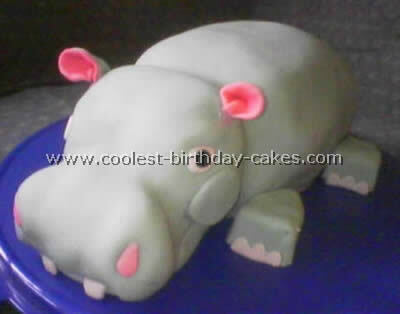 It’s sculpted from two sheet-sized layers of cake and airbrushed. The turkey legs had to be reinforced with dowels. This Thanksgiving cake was made by baking two cakes in a round glass bowl and sticking them together with frosting to make the body. Cut the bottom of the rounded pieces flat for it to sit nicely. 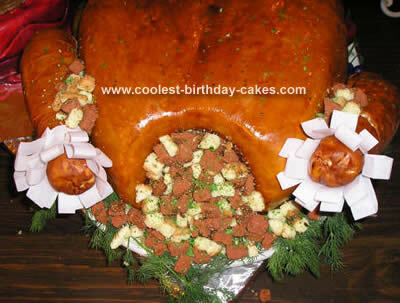 The legs were cut out of a sheet cake made of spice cake. I cut up more of the spice cake into small squares to be used for the stuffing at the back of the turkey. I used dowels stuck through the legs and into the main body part to support them. The white drumstick covers were made from coffee filters and I added lettuce and orange slices around the sides for atmosphere. 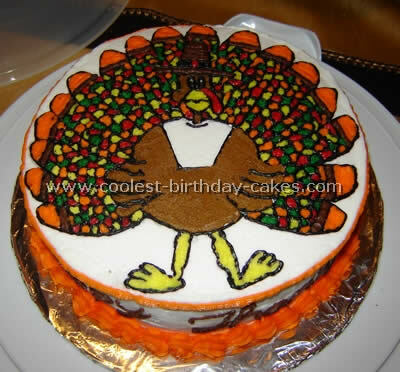 This cake was baked in the Wilton turkey pan, then outlined and decorated in butter cream. 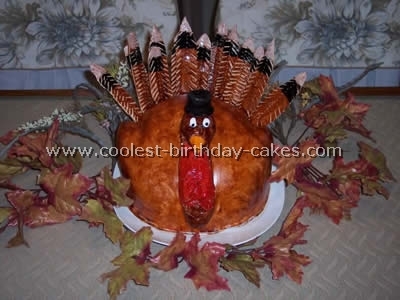 This thanksgiving cake was made with a round mold. 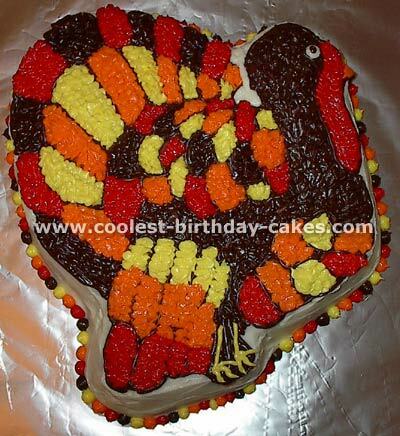 The turkey’s tail was made by cutting the bottom part of the cake. The head is a cupcake. 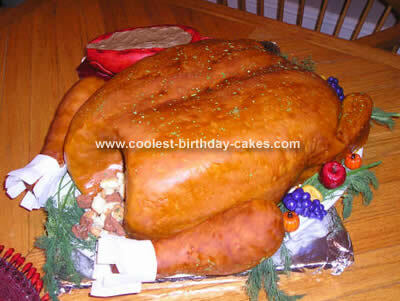 The turkey’s beak was also made from a piece of cake. The hat was made with a round cookie and a marshmallow cover of chocolate. This was a 2-layer 8" round spice cake with apple filling, iced in cream cheese icing. The turkey image was found in an online coloring book page. I traced the image on parchment paper and filled in with buttercream; then froze it for about 20 minutes before transferring it onto the cake.